This topic describes how your app can extend the Windows Phone photos experience. Learn about how your app can appear in the Photos Hub and built-in photo viewer, and when launched, automatically open the same photo that the user was viewing. For info about how your app can integrate with Windows Phone as a Lens or auto-upload app, see Lenses for Windows Phone 8 and Auto-upload apps for Windows Phone 8. The goal of extensibility is to save users time and provide a convenient transition from the built-in photos experience to your photo app. For example, let’s say a user was viewing a photo with the built-in photo viewer and then wants to edit that photo with your app. Without extensibility, they would have to tap Start, open the App list, start your app, and then reselect the same photo. But with extensibility, they can simply swipe-up the app bar, tap edit, select your app, and the same photo can be opened in your app without any selection required on the user’s part. If your app is a photo-related app, it can be launched from the Photos Hub or from the built-in photo viewer app. However, there are other requirements that you’ll want to consider so that your app can be certified for the Windows Phone Store. For more info, see Additional requirements for specific app types for Windows Phone. In the current release, the Extras.xml and E0F0E49A-3EB1-4970-B780-45DA41EC7C28.xml files are not required for photo extensibility. When upgrading apps to Windows Phone OS 7.1 or Windows Phone 8, remove these files and use the new extensibility techniques described in this section. The following table lists the photo-related extension points, their extension names, and the URI keywords that are present in their launch URIs. This table also lists which versions of Windows Phone apply to each extension point. The rest of this topic introduces these extension points. The Photos Hub allows you to flip through your photos, browse your online albums, and catch up with your friends’ latest snapshots. There is also an apps pivot page that is dedicated to photo apps. When you extend the Photos Hub, your app appears in this pivot page. From left to right, the following image shows how to navigate to your app from the Photos Hub. After opening the Photos Hub from the Start screen, swipe to the pivot page named apps. Note that the apps pivot page will not appear in the Photos Hub until you have at least one app installed that extends the Photos Hub. From the list of apps on the apps pivot page, tap the app link to launch the app. 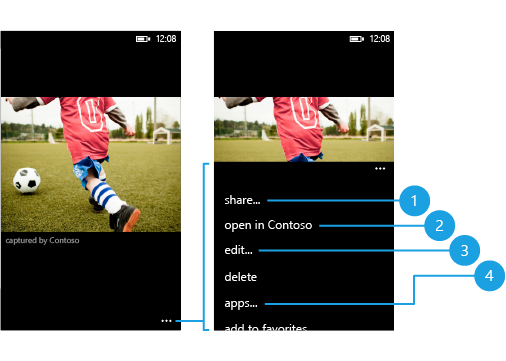 For more info about how to integrate your app with the Photos Hub, see Extending the Photos Hub for Windows Phone 8. When viewing a photo with the built-in photo viewer, you can tap the app bar for a variety of options. Depending on which version of Windows Phone your app is targeting, your app can integrate with one of the extension points shown in the following image. Extend the share picker: Your app can be launched from the share link and provide a compelling experience for sharing the user’s photo to a web service. For more info, see Extending the share picker for Windows Phone 8. Integrate your rich media app (Windows Phone 8 only): When viewing photos captured by your rich media app, the app bar presents a special open link specifically for launching your app. For more info about rich media apps and how to integrate them with the photo viewer, see Rich media extensibility for Windows Phone 8. Extend the photo edit picker (Windows Phone 8 only): Your app can be launched from the edit link and allow the user to edit their photo. For more info, see Extending the photo edit picker for Windows Phone 8. Extend the photo apps picker (Windows Phone OS 7.1 only): Your app can be launched from the apps link and allow the user to edit their photo. This extension point will be deprecated in a future release. New Windows Phone 8 photo editing apps should extend the photo edit picker instead. For more info, see Extending the photo apps picker for Windows Phone 7. An app that extends the share picker can also extend one of the other extension points, but make sure that the app launches to the relevant page in your app. For example, let’s say your app extends the edit and share links because it can edit photos and share them to a web service. When the user clicks the edit link, they should land on a page that shows them their photo and immediately allows them to edit the photo. When they click the share link, they should land on a page that shows them their photo and immediately allows them to share it. But, as you can imagine, it would be quite jarring for the user to land on your app’s share page after they clicked the edit link. For more info about mapping launch URIs, see the respective how-to topics in the list above. The photo apps picker will be deprecated in a future release. New Windows Phone 8 photo editing apps should extend the photo edit picker instead. For more info about that extension point, see Extending the photo edit picker for Windows Phone 8.